I think my practice has helped me with road rage. First I wouldn’t say I’ve ever had crazy road rage or anything- but everyone gets mad about being stuck in traffic! I used to spend the time stuck in traffic angry. Now what’s the point in that? I’m stuck no matter what I’m feeling. Why spend that time angry? I think it comes back to being comfortable being uncomfortable in the hot room. Bikram yoga has really helped me in uncomfortable situations. Traffic included. These days when I’m in traffic I just put on some good music and jam out. We should make the best of a crappy situation! I try to let people in and give the curtesy wave when people let me in (what happened to the curtesy wave anyway?). I didn’t notice my loss of road rage until riding in the car with my hubby and he get all angry and I’m fine. I realized we were stuck and moved on. It’s like in class: yes it’s hot as hell- let’s move on. Amazing! I love geeking out about yoga and that’s what about 50 of us did for 5 glorious days. We took Bikram classes, we took more general unheated yoga classes. We worked on our hips, our shoulders, our backs, our arms. We learned new ways to open our bodies and improve our balance. We got help getting into postures (either being talked through it or actually being physically helped). We’ve been done since Wednesday afternoon and I’m STILL sore. It was amazing to have three different teachers all with different backgrounds! We had Dev, a non-Bikram yogi who grew up in a yoga school in India but currently lives and practices in Singapore. 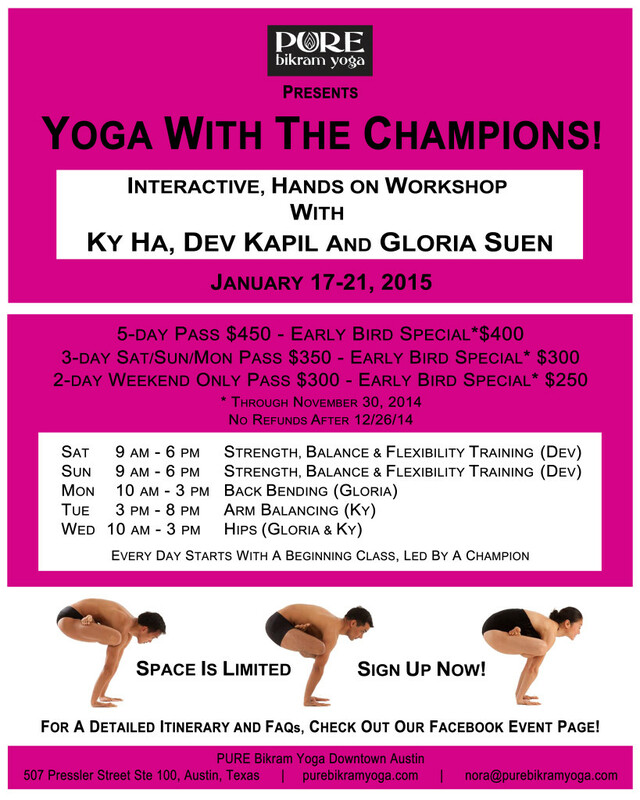 We had Ky, Bikram teacher, champion extraordinaire from London. We had Gloria, a Bikram yogi, international champion, who works a nine to five job (a non yoga teacher). All three were amazing and would help all of us as one of them taught the postures. It was an amazing way to spend the weekend after my birthday! My hubby’s birthday was during the workshop and he was cool about the fact I wasn’t around in his birthday. I’m so lucky to have a hubby that understands my yoga habit! I took some pics but I feel like there’s a controversy over whether you should post pics of yourself doing yoga….. In an effort to not offend anyone I’ll refrain from including them. I really just took them to remember some of the postures and stretches since there’s no way I could remember them all. But spending all this time getting bendy we were all able to get further into postures than ever before. I even got into a couple arm balancing postures (which I thought would be impossible for my weak core). I am so grateful for those three champions, my studio, my husband, and my friends that enabled me to go to and enjoy the workshop! I’ve been to yoga twice since and it’s really changed the way I think about yoga. Whoa!!!! What an intense awesome day! It started with a regular bikram class with Ky. I LOVE practicing in a large class. This large class was full of very dedicated yogis. We were all excited for the day and you could feel the energy!!! For one yogi it she was too excited to sleep she said it was like she was a kid and the night before was Christmas Eve. (I couldn’t stay asleep either, I was excited and nervous). There’s a video out there of it. I’m sure it’s not pretty. I’m not sure I want to see it. Lots of people had phones to take pics yesterday. I’m def bringing mine today so I can try to document all the things we’ve done so I can keep up with all these postures and stretches! By the last hour we were done. We all kind of pooped out. Thank god beyond the bikram class in the morning the room was unheated. We warmed up just fine!! I’m not as sore as I was worried about. But I’m sore for sure in my shoulders and back. Time to pack my stuff for day two! The same schedule as yesterday!!!!! Training with the Champions this weekend! I’m excited a nervous about the yoga workshop I signed up for at my studio. It’s 5 days of yoga with three expert yogis. Two days of 9 hours a day and then three days of 5 hours per day. Am I going to learn a lot? Heck yeah! Will it be fun? I bet it’s going to be a blast. A teacher once told me if you practice yoga on your birthday you turn a year younger. That makes me 29 for the 5th time today!! 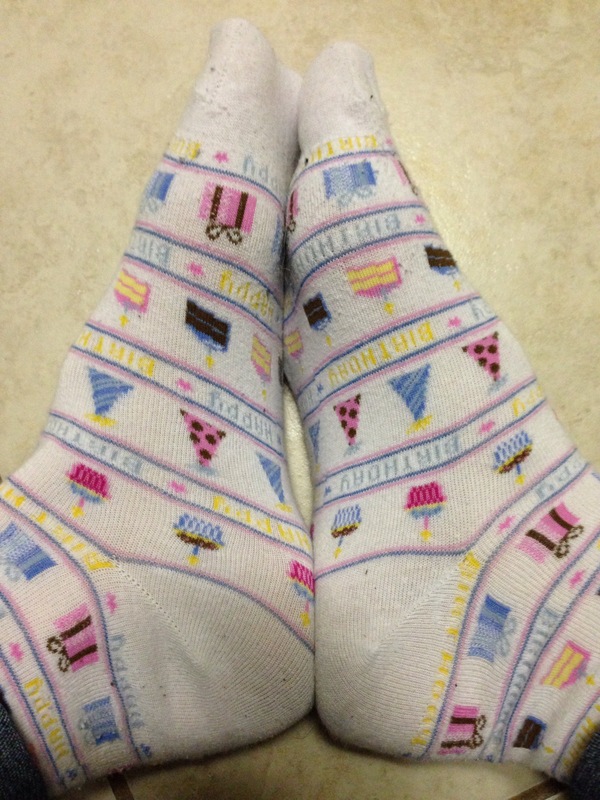 Here are my birthday socks I only wear on my birthday. Honestly, I can’t believe I really did it. I actually got on a stage in a LEOTARD and did yoga. In front of A LOT of people. Those people included my hubby, two friends, and my parents. Now my hubby and friends have been to yoga with me and encourage my yoga habit. My parents, on the other hand, aren’t on board with all the Bikram I do. They haven’t done it and don’t get it. I wasn’t surprised when I got somewhat shocked and judgmental reaction when I told them I was competing. Isn’t it just an oxymoron to have a yoga competition? I wasn’t good at answering them at the time and honestly I had to choke back the emotion a bit. I’m very close to my parents. I didn’t expect everyone to see a yoga competition as a positive thing. It does sound a little weird! But I didn’t expect people to judge me for choosing to do it. That was a little hard for me. Now that I’ve done it- I’m proud!! I got on a stage in a leotard and celebrated yoga with fellow yogis. I loved training for it (it was tiring and took a lot of time though). I loved talking about yoga with my fellow competitors. I made some new friends doing it. My parents came and cheered me on. I think they were actually PROUD of me and my yoga that day! That alone made it 100% worth it to me. In the end I met my goal for the competition: I didn’t fall out of any postures. I did have an amazing group of supporters in the audience to cheer me on with signs and shirts with my face on them! What crazy cool friends right? No, no rehab was needed for my toe but my yoga world was definitely different for a while. I had to keep it buddy taped for quite a while during yoga. Before being officially cleared by the doctor I was super super cautious in the hot room. No awkward at all, I’d just stand there with my arms up in position. No balancing on the foot. I think the fear of jacking up my toe before seeing the doctor kept me happy with taking it easy. It was also only three classes before I went back for my follow up appointment. After being cleared by the foot doctor to do anything unless it hurt my toe I went into yoga a little more bravely. I started with the first part of awkward, since there’s no tippy toe action. My teacher’s suggestion? Do the first part of awkward for all three three parts of awkward. That means going into the first part of awkward SIX TIMES?!? Jesus that was tough!! I also obviously didn’t do toe stand on that toe. A week or two later I added the third part of awkward. Another week- toe stand. Lastly second part was added back. The human body is truly amazing. Within 8 weeks of really really breaking my toe I was back to normal yoga. I even jumped back into advanced class (had to start getting ready for the championship!) within about 8 or 9 weeks of the break. Let me remind everyone- watch where you walk! Thou shalt not walk and watch TV at the same time! Yes. It was early July and the World Cup was in full swing and it popped on the news so as I was walking by the coffee table I turned my head to see the tv and caught the leg of the coffee table with my toe. The coffee table won. I shouted some curse word like I normally do when I stub my toe then I looked down. IT WAS STICKING OUT THE WRONG WAY?!? Pure freak out ensues. I yell for my hubby to come into the room. My common sense told me that maybe it was dislocated- I asked the hubs to push it back. He looked at me like I was insane and I asked him again…. he actually did it. Bad idea!!! A nasty painful crunch was what I got out of that. We hop into the car and go straight to the minor emergency that’s about a quarter mile from our house. They asked when it happened….. Uhhh 5 minutes ago? First some kind of pain killer shot. Of course there were x-rays. Then the PA says it’s time to reset the toe. She actually told my hubs to hold my hand and that we shouldn’t look. Of course hubs watched and of course I watched his face. GROSS! The foot was re x-rayed and the PA was a little too excited that she was able to reset the toe. If she was that unsure should she have tried it in the first place?????? Two days later I see the foot doctor and he’s amazed that anyone was able to reset it! He said that 95% of breaks like that require surgery. SURGERY on a pinkie toe?!? Thank goodness!! Three weeks of the toe taped up and in Birkenstocks. 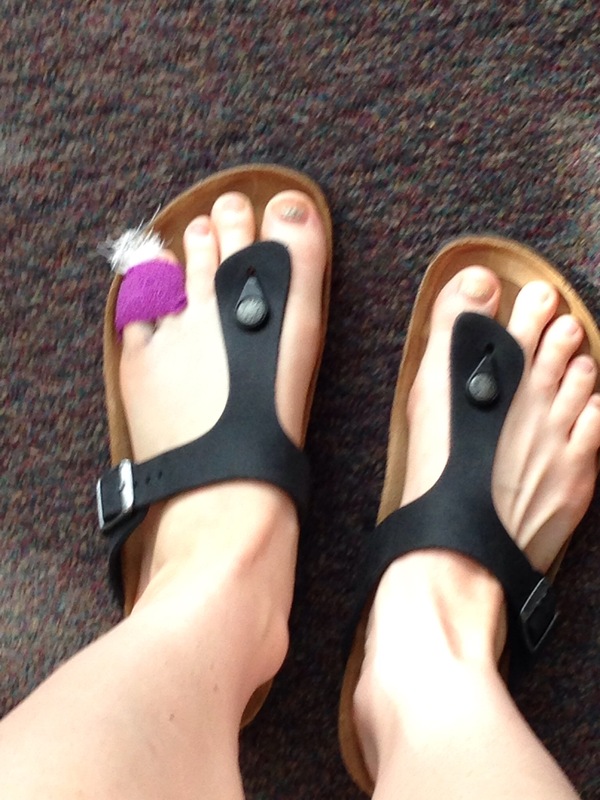 I had to buy and wear Birkenstocks nonstop for three weeks. ***part of me wanted to post a pic of the toe sticking out or the x-rays but I realize some people may not find that as interesting as me. Here are my Birkenstocks. Note how blue and swollen my taped up toe is. I didn’t realize how swollen it was until I had to let that shoe’s strap out more than the other! Thank goodness that amazing PA was able to reset that toe because three days later the hubs and I were off to Mexico for vacation. Thankfully the vacation wasn’t a physically strenuous vacation. It was an all inclusive sit by the pool bring me drinks kind of vacation. I do enjoy walking on the beach, which I couldn’t really do. I could kayak in the ocean though! That was wicked cool- we saw a sea turtle! Three weeks without yoga was a whole different story. I’m a school teacher, so the summer is prime yoga season! The first week of toe restriction during vacation wasn’t too bad. I did want to try their yoga by the beach at the resort, but it wasn’t the end of the world. Two weeks at home without yoga? Oooohhhh man that was tough. Once I could handle walking around easily I cleaned the house. I deep cleaned the entire thing- the closets got reorganized, I scrubbed out the fridge! I cheated on the toe restriction. I went back to yoga two days before my follow up with the foot doctor. I was very cautious. No standing on only that foot, no awkward, what you’d think. At my appointment my doctor cleared me to do anything as long as my toe didn’t hurt. He said after three weeks my toe was 80% as strong as before the break! The human body is crazy cool! So. Three weeks without yoga after three years of a 6x a week was intense. I missed it, I mean really missed it! Whatever you do people- don’t walk and watch TV!! Even though I haven’t been writing about it I’ve been up to yoga. This summer I broke my pinkie toe. Like really broke it. It was sticking out about 45 degrees the wrong direction. I was lucky I didn’t need surgery. You shouldn’t watch tv and walk at the same time. Lesson learned. This month I started a challenge with my studio. It’s going to be either 30 or 60 days. I’ve said I wouldn’t do a challenge again, but I debunked my injury theory. When training for the championship I did 108 classes in 108 days without issue. My theory of injuring myself because I need a day off was debunked. In a couple weeks I’m attending a 5 day interactive yoga workshop at my studio. In 5 days we’re working on yoga for 33 hours. I may break myself but I’m excited to learn more about myself and more about yoga!! World Yoga Sports Championship is this weekend! If yoga competitions are your thing it’s being streamed live from the International Yoga Sports Federation!! Great source of yoga inspiration!! Go our national champions Gloria and Gianna!! Great quote from a teacher this week…..
What changes after a week off yoga?